Bubble wrap is the trademarked name for a packing material consisting of two plastic sheets laminated together in a way that traps air bubbles in small, uniform pockets. This plastic sheet assembly is used as a flexible cushion to protect fragile objects during storage or shipping. The name Bubble wrap is registered by Sealed Air Corporation of Saddle Brook, New Jersey, however the name has become synonymous with the packaging material itself. Similar materials are known in the industry as cushioning laminates. The need for efficient, protective packing material has been long recognized. Originally, shredded paper and rags were used for this purpose. Other materials that have been used historically include pulverized mica and corrugated cardboard. As plastics technology matured in the 1950s and 1960s, new and improved packing materials were developed. Foam beads made from polystyrene plastic are one popular example of plastic packing material; these are more commonly known as Styrofoam peanuts. Another innovation based on plastic technology is cushioning laminates, a packing material that relies on air to cushion and protect highly fragile objects. The first use of these laminates dates back to the early 1970s when methods used to process plastics became increasingly sophisticated, allowing cheap and rapid manufacturing. Today, they are made by a number of companies both in the United States and abroad. While a variety of manufacturing methods are used, the basic process involves trapping air bubbles between two laminated sheets of plastic. Cushioning laminate is primarily made of plastic film or thin sheet formed from resins such as polyethylene and polypropylene. These resins are widely used because they perform well and are relatively inexpensive. They can be cast into strong, flexible films, which have the ability to hold air without leaking. Furthermore, these resins are thermoplastic materials, which means they easily can be melted and molded. This is an important property since the plastic sheets may be reheated during processing. Different types of resins may be used to make the top and bottom sheets to give the cushioning laminate special properties. For example, one layer could be made with a more rigid material to give the finished product increased stiffness. The polypropylene or polyethylene films are formed with a variety of additives mixed with the base polymers in order to modify their properties and to facilitate processing. These additives include lubricants and plasticizers which control the flexibility of the resin blend; ultraviolet light absorbers, heat stabilizers, and antioxidants which inhibit different types of degradation; and coupling agents and strength modifiers which improve the bond between the polymer and the filler. Furthermore, antistatic agents are added to reduce buildup of static electricity and biocides may be included to inhibit microbial growth. plastic compounding and sheet extrusion, lamination, and finishing operations. 1 Plastic resin that has been compounded to the manufacturer's specifications is purchased in bulk from a supplier. In this compounding process, the polyethylene resin is heated and mixed with the additives described above. This mixture is then melted and formed into small pellets 0.125 in (0.3175 cm) in diameter. At the beginning of the manufacturing process, these pellets are introduced into a molding machine, known as an extruder. At one end of the extruder is a hopper into which the pellets are dumped. This hopper feeds the pellets into a long heated barrel. This barrel is equipped with a screw mechanism, which pushes the plastic forward. At the other end of the barrel is a stainless steel sheeting die that can produce sheets up to 10 ft (3 m) wide. 2 The resin melts as it moves along the heated barrel, and by the time it reaches the end, it can be easily forced out through the opening in the die. As the molten resin is squeezed through the die it is shaped into a sheet which is then processed further. Depending on the process, the sheet can be laminated to another layer immediately while it is still warm or it can be cooled and laminated later. In either case, after being extruded the sheet passes through a series of stainless steel rollers, known as a three roll finisher or a three roll stack. These rollers are 10-16 in (25.4-41 cm) in diameter and are internally cooled with water. As the plastic sheet exits the die, it enters the nip, the point where the top two rollers meet. The sheet is pulled in by the motion of the rollers and is passed through the top, middle, and bottom rollers. These rollers cool the sheet while helping it to maintain the correct size and shape. After passing through the three roll stack, the sheet enters another series of rollers known as pull rolls, which drag the sheet through the rest of the processing. that traps air bubbles. Uniform placement of these bubbles across the face of the sheet can be achieved by stretching or perforating the substrate sheet in a designated pattern. These uniformly placed deformations in the sheet will retain air and form individual pockets. The process of deforming the substrate sheet requires heat to soften the plastic. As noted, this step can be performed immediately after extrusion while the sheet is still warm or the sheet can be reheated and molded at a later time. Bubbles can then be molded into the softened sheet by exposing it to a forming surface. This surface may be a roller or a plate with protrusions in the desired shape and distribution. When the molten sheet is brought into contact with the forming surface, the plastic is molded in the desired pattern. 4 One method of creating these air pockets uses a rotating belt as the forming surface. This belt has a number of holes spread across it. 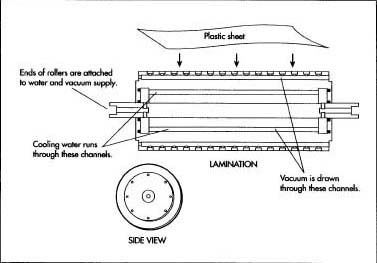 As substrate sheet moves along the belt, suction is applied from a vacuum source to the holes in the belt. The air pressure differential causes the plastic to stretch down into the holes on the belt, thus creating a series of pockets. Another method employs a molding plate as the forming surface. The plastic sheet is moved into place below this plate through which a vacuum is drawn. The suction causes the sheet to conform to the bumps in the mold plate and produces a molded sheet having the desired irregular surface. 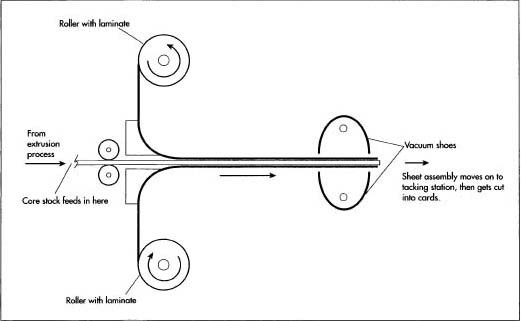 A third method uses a rotating molding cylinder to form the air pockets in the plastic. 5 After the air pockets have been formed by one of the methods described above, the substrate sheet and a second sheet are fed together through a set of laminating rollers. At least one of the sheets must be at the proper temperature to ensure bonding will occur. The pressure and heat seals together the sheets and the air bubbles remain trapped. may be performed before or after lamination process. 7 After the cushioning laminate is completed, the sheet material is cut to the appropriate size. This may be done as part of the primary processing or the uncut wrap may be stored on large rolls and cut to size later. This cutting process is known as slitting and is accomplished with special knives which can slice cut through the thick layers of plastic. The laminate may be packaged and sold on rolls or in sheet form. The major waste product from cushioning laminate manufacturing is the plastic resin. Resin that is contaminated, overheated, or otherwise ruined must be discarded. However, sheets that fail quality checks for reasons related to physical molding problems can be reworked. This recycling process is known as regrinding and shredding the sheets, remelting them, and re-extruding them as new sheets. To ensure the plastic meets physical specifications, regrind may be mixed with virgin resin. This can be done without loss of quality because of the thermoplastic nature of polypropylene. As with other plastic manufacturing processes there are several key areas that must be closely controlled to ensure a quality product is produced. During the compounding process, the resin and additives must be added carefully to ensure the formula components are blended in the proper ratios. The finished resin may be analyzed to ensure its chemical and physical properties meet specifications before sheet extrusion operations begin. At the start of the extrusion process a small amount may be flushed through the barrel of the extruder. This purging process cleans out the barrel and reveals any problems with the molding systems. During extrusion, it is critical that the resin is kept at the proper temperature. The flow rate of the polymer will vary according its molecular weight and temperature. If the temperature is too cool, the resin will not move through the die properly. If the temperature is too high, the polymer may undergo thermal degradation. Overheating can cause chemical changes in the resin, making it unusable. Unwanted chemical interactions can also effect the quality of the plastic sheets during the extrusion process. One problem is oxidation, a reaction with air that can negatively affect the plastic. Similarly, interaction with moisture affects the quality of the plastic. If too little moisture is present, certain plastic blends can become too brittle. After the extrusion process is complete, the extruder must be properly cleaned. Thorough cleaning is necessary before working with a different resin because traces of the previously used resin can contaminate the new batch. Die cleaning is best done while the machine is still warm and left over resin can be easily scraped out. Other factors must also be monitored. For example, in certain methods of manufacturing it is important that top and bottom plastic sheets respond to heat differently so that during the lamination process one sheet distorts but the other does not. For this type of operation, it is critical that the heat distortion of the two sheets differ by at least 77° F (25° C) or problems will occur during lamination. After the cushioning laminate is completed, samples may be evaluated to ensure the sheets meet specifications for strength, bubble bursting point and other criteria. Improvements in plastics technology continue to occur at a rapid pace. These advances are likely to produce improved plastic compounds that are easier to process, provide better cushioning ability, and are biodegradable. The latter quality is of particular significance considering that packaging material is a disposable product and is used in considerable quantities. Cushioning laminate made of plastic, which could safely breakdown without negatively impacting the environment, would be a great asset to the industry. While improvements in equipment used in the manufacturing process continue to be made, they may be slow to come to market because replacing existing machines may be prohibitively expensive. One new method of manufacturing circumvents the need for costly forming equipment. Instead, this method uses a plastic substrate sheet as a pattern to form the bubbles without expensive molding equipment. In this process, a thin plastic sheet is first perforated in the desired bubble pattern. This layer is laminated to a substrate sheet and the combination is then passed through heated pinch rolls. Vacuum or gas pressure is applied to draw the film through the perforations in the substrate. This process creates bubbles without the use of a forming surface. It remains to be seen if this, or other new manufacturing methods, will be embraced by the industry in the future. Green, Joey and Tim Nybery. The Bubble Wrap Book. Harper Perennial Publishers, 1998. The Sealed Air Corporation: http://www.sealedaircorp.com/ . US Patent 4,681,648 Process for Producing Cushioning Laminate.